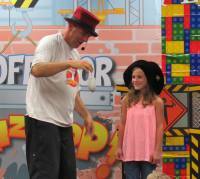 Professor Whizzpop's Magical Mayhem show is perfect for kids or family stages at festivals and fairs. It's a fast paced fun filled magic show with lots of laughs, galloons of giggles and amazing magic. The show can be adapted to your festival timing and can run from ten to forty five minutes and is guaranteed to amaze, amuse, ispire and enthuse your festival guests. Tom Fool's street show is a half circle street performance featuring classics of magic and plenty of Olde Worlde whit. Everybody is a part of the show and it can be used to draw crowds to any area in your festival footprint.